Just get a shiny iPhone 7 or iPhone SE, or iPhone 6s and need to move all your old data to your new device? You will want to transfer data from old iPhone to new iPhone, like iPhone 7. The problem is, how to do that? As a matter of fact, if iPhone users have updated their iPhone backup with iTunes or iCloud, they are able to move most of the important data from old iPhone to new iPhone 7 by restoring new iPhone with the backups. Besides iTunes and iCloud, there is another method that can enable users to transfer all data from old iPhone to new iPhone with ease. Follow the post below to know how to do that. 1. Run iTunes and choose “Edit > Preference > Device > Prevent iPods, iPhones and iPads from syncing automatically” at the upper left corner of the window. 2. 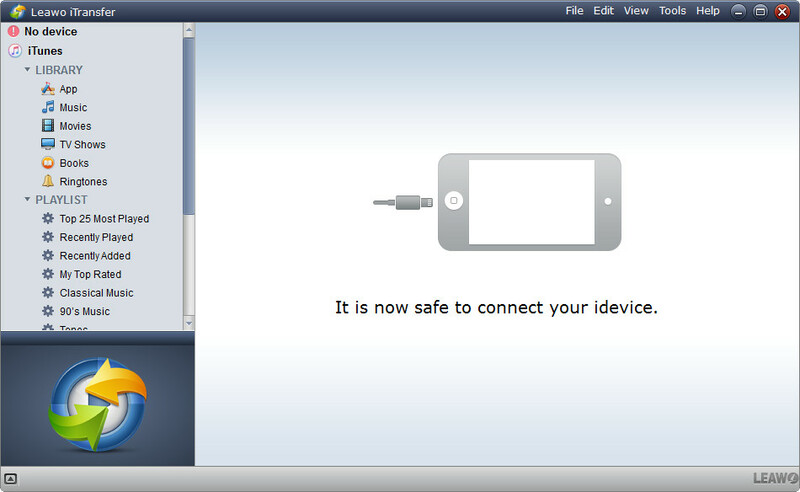 Plug the old iPhone into computer via the USB cable, and iTunes will recognize your iPhone. 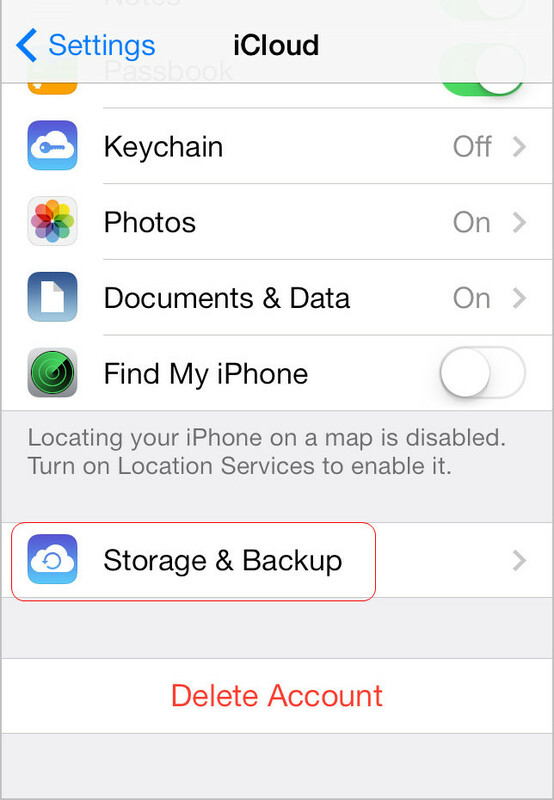 Right-click the name of your iPhone and choose “Back Up Now” in the drop-down menu. 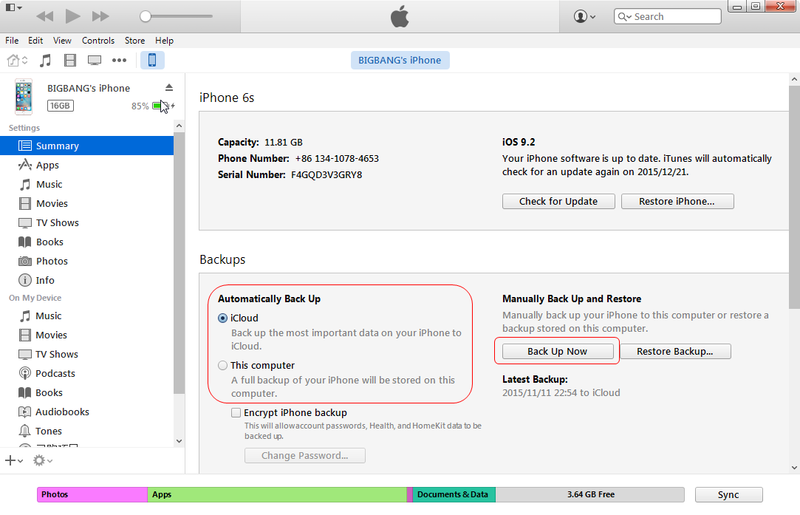 3. iTunes will create a backup of your iPhone, and you may have to wait for a while until iTunes finishes backing up your iPhone. 4. Disconnect the old iPhone and plug in the new iPhone. 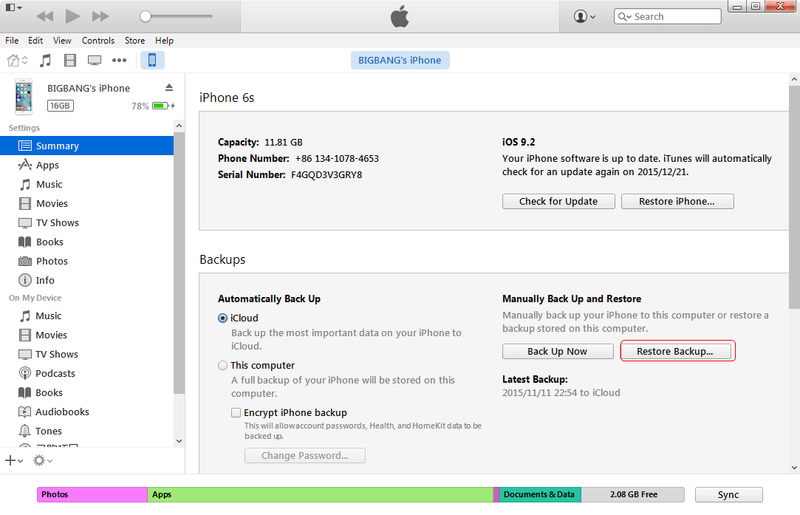 After iTunes recognized the new iPhone, and at the “Set Up iPhone” screen, select “Restore from iTunes Backup”. 5. Select the most recent backup you just made from the restore menu in iTunes, then click “Continue”. When the restoring process is done, the new iPhone will restart. When the restoring process is finished, the data will be imported into your iPhone 6/6s/SE/7, but the media files, such as music, videos and so on, won’t be transferred to the new iPhone. If you have purchased albums in iTunes Store, you will have the songs in your purchased history, and you are able to download the songs on your new iPhone directly by entering iTunes Store with your Apple ID. You’ll need good Wi-Fi connection to finish the task. This is by far the easiest method and it doesn’t require a PC or Mac, but it relies on having iCloud set up on the original device. 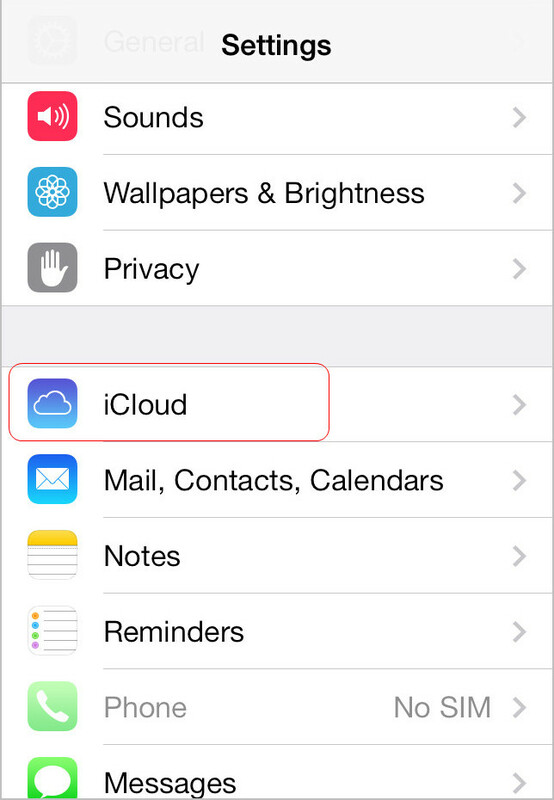 If you don’t have iCloud set up or you have a slower internet connection, jump to the iTunes method above instead. 2. Launch Settings from the Home screen. 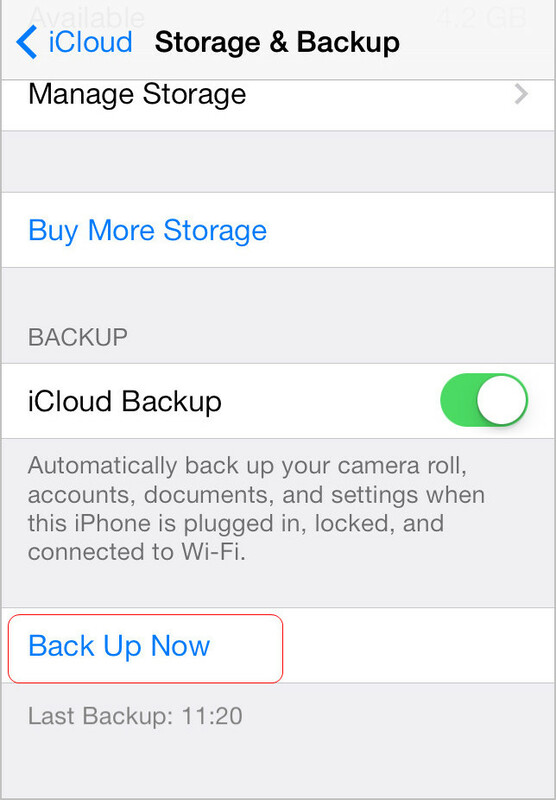 Tap on iCloud > Backup. Then tap on Back Up Now. 3. Boot your new iPhone, and walk through the easy setup, then choose “Restore from iCloud Backup” when you’re at the Setup Assistant place. Then log in your iCloud account and choose the backup of your old iPhone, click “Restore” to get it to your iPhone 7. Wait till the iPhone has finished restoring from a backup. When the restore process is complete, your iPhone will restart. Then it will be ready for use. You should also connect the device to iTunes to sync data not contained in the backup (such as music, videos, apps, and so on). You should now be able to use your shiny new iPhone 7 or iPhone 6s. After the data has been restored, you can turn on your older iPhone on and erase all the content all the content and settings. These methods above are helpful for transferring data from old iPhone to new iPhone 7, but they won’t help you transfer to the non-purchased files, like CD copies, ripped videos and so on. At this moment, you will need the iPhone transfer software to transfer non-purchased files from old iPhone to new iPhone. Leawo iTransfer will provide much help on this issue. 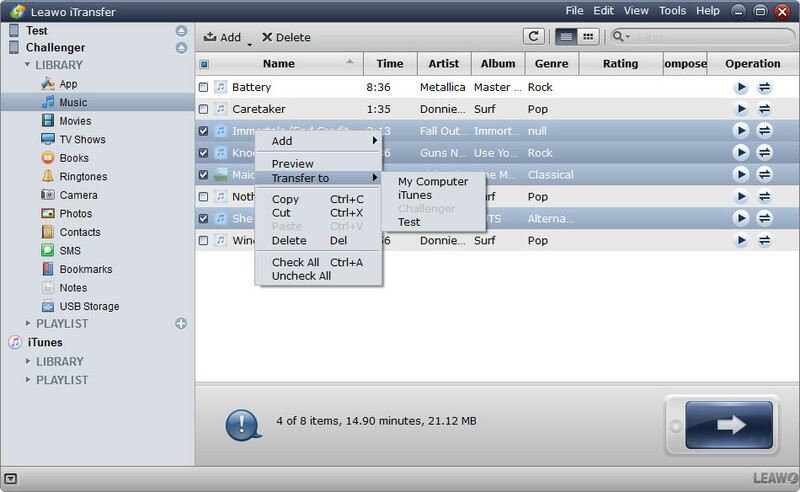 This software is used for transferring files among iOS devices, iTunes and computers, and it allows users to transfer non-purchased items without the sync of iTunes. The following guidance will set transferring music as an example, and show you how to transfer iPhone data to new iPhone 7. You can free download the software to have a try. Step 1. Run Leawo iTransfer and connect both two iPhones to computer with the USB cable. Step 2. Click the name of your old iPhone, and choose Music in the left sidebar. The music files will show up in the right part. Step 3. 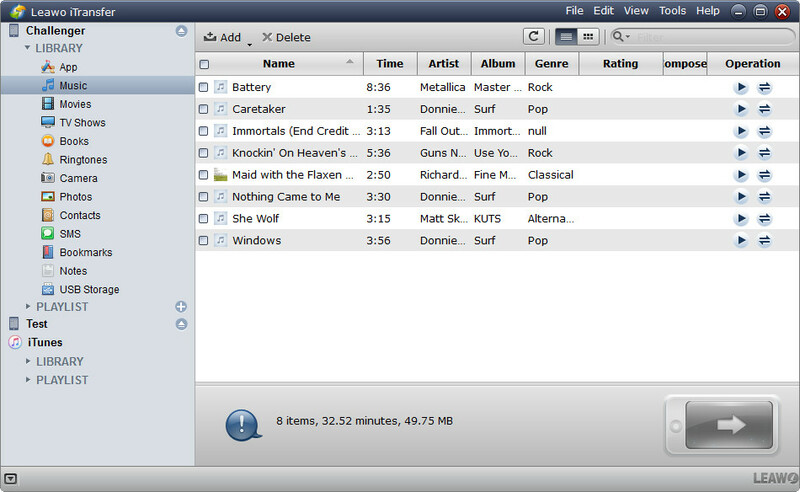 Select the music files you need, and click the transfer button at the right bottom. Or right-click the selected files and choose Transfer to > iPhone 7. Step 4. Check Transfer to List and choose new iPhone as a target. Then click Transfer Now to start transferring data from old iPhone to new iPhone 7. When the transfer is finished, you will get the music files in your iPhone 7. Please note that all the music files in your iPhone Music Library will be recognized by Leawo iTransfer, so you don’t have to separate the non-purchased music files from the purchased ones. 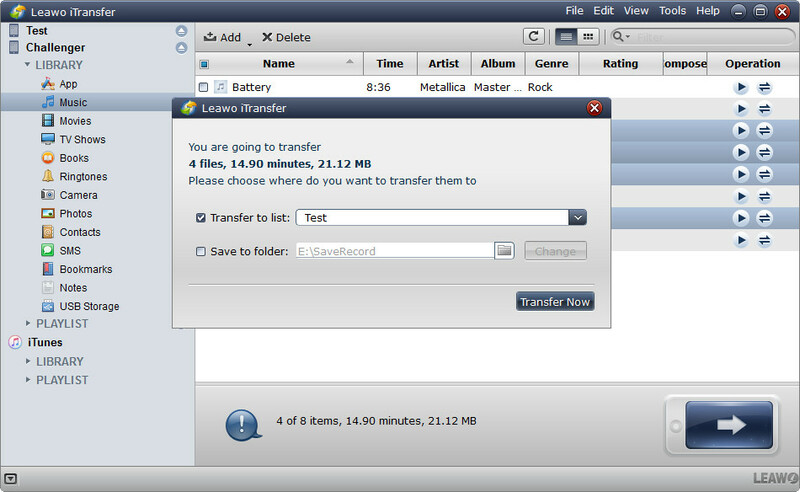 Leawo iTransfer is helpful for various kinds of data transfers for iPhone, iPad and iPod, and users can take advantage of the programs to backup iPhone, iPad and iPod data, for example, users can backup pictures from iPad Pro to computer with Leawo iTransfer. If you are interested in this software, just check it out.